Therefore, the days of Jalsa Salana must be utilised by every participant (be it guests or duty workers) to make every possible effort to attain the nearness and pleasure of Allah Almighty, or else, undertaking this arduous journey to attend this auspicious occasion is to no avail. In fact, the responsibility lies doubly on the shoulders of the workers as they must not only serve the guests of the Jalsa Salana, but also listen to the Jalsa program and gain benefit from it. It is imperative to remember that these three days of Jalsa Salana are an opportunity to practically implement these above-mentioned objectives in order to progress in faith. The Promised Messiah (as) stated: “The hearts of my true followers are ever inclined towards the Hereafter.” This means that true followers are always concerned with the attainment of the highest rewards i.e. pleasure of Allah Almighty. It is important than one must make individual and personal efforts to practically implement the objectives, but also to supplicate to God Almighty to help him attain this ultimate objective. O Allah, guide us onto the right path with Your Mercy and Blessings. Fill my heart with Your Love so that my every step leads me to the path that directs me to You. Allah Almighty has taught us ways to supplicate, and given us teachings of the best moral values. The Promised Messiah (as) stated that one cannot attain the high standards of faith unless and until one does not give precedence to the comfort of his brother over his own comfort. He says that one must feel the discomfort of his brother as his own discomfort. Huzur (aba) directed the attention towards some of the highest moral values we must all make every effort to attain. It is absolutely essential to shun all ego and progress in attaining righteousness (Taqwa). If one wishes to attain the blessings of attending Jalsa Salana, he must look past any differences or conflicts he may have with fellow Ahmadis. Huzur (aba) said that we are not like other mis-guided Muslims who have ignorant leaders who inspire their followers to slit the throat of innocent people. We should pray for these mis-guided Muslims that instead of ruining the name of Islam, they may be guided towards the correct teachings and present the beauty of Islam to the world. The Holy Prophet (saw) has said that a true Believer is one from whose hands and tongues every other human being is safe. Huzur (aba) expressed his desire that Muslims in the world today would understand this beautiful teaching of Islam. He said that since the Muslim leaders have rejected the claim of the Promised Messiah (as), it is incumbent upon the Ahmadis to show the beautiful face of Islam to the world. Huzur (aba) said it is extremely important to look after the underprivileged amongst us, not by doing them a favour, but by understanding this as their God-given right. In this regard, Huzur (aba) mentioned a recent survey which has shown that it is the religious communities that give the most charities in the world, and among the religious communities, it is the Muslim communities that are most advanced in this philanthropic generosity. The Jalsa Salana is an occasion where the comfort of others must be taken into account and because of such a large crowd gathering in a small vicinity, many instances arise, when one must display an attitude of affection and self-sacrifice towards others, even at the cost of his/her own comfort. Similarly, one must shun all pride and adapt an attitude of humility. Truth, expression of truth and justice must prevail in all our actions, even if it means giving witness against a loved one. Forgiveness and patience are virtues that every Ahmadi must practice. The most beautiful Quranic injunctions regarding absolute justice and kinship have no comparison in any other scriptures. When all participants of Jalsa Salana will adopt these high moral standards, a most beautiful atmosphere will be created, which naturally attracts people towards Ahmadiyyat. Huzur (aba) said that there must be many in the audience who have been a source of inspiration for others to accept Ahmadiyyat, as people from around the world write letters about their most positive and spiritual experiences at Jalsa Salana. They often express their astonishment as to how such a large crowd of people can gather in peace. During the Jalsa Salana Germany held two months ago, a non-Muslim couple who had a negative impression of Islam attended the Jalsa with the intention of being severely critical of it. Instead, they were so inspired and impressed with the event that they accepted Ahmadiyyat and performed Bai’at. Huzur (aba) reminded the workers that through their model behaviour and service, they are doing silent Tabligh. But in actuality, every guest (man, woman, child) attending the Jalsa Salana is doing silent Tabligh as well. This exemplary behaviour during Jalsa Salana should not be a temporary display of model behaviour but each individual must endeavour to bring about a permanent change towards goodness. 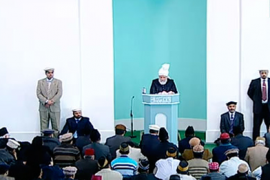 Huzur (aba) stressed on the importance of saying “Salam” to one another. This act of saying salam can actually become the source of establishing peace in the world today, the condition being that one must say salam to everyone (not only to friends and relatives) with the best possible intention and with the most genuine compassion. In the end, Huzur (aba) also drew the attention of all Jalsa participants towards some organizational matters. Men who are accompanied by their children aged 7 or above must remain in the marquee and listen to the Jalsa program instead of roaming around outside, which causes disturbance along with lack of discipline. Similarly, women with little children must refrain from indulging in conversations while the program is in progress and make every endeavour to listen to the speeches. One must listen to all the speakers rather than picking and choosing a few select orators, as every speech is replete with knowledge and source of blessings. Workers on duty must discharge their duties with full responsibility and participants are urged to listen to the workers, even if they are younger than them in age. Especially during times of peak congestion, display patience and show exemplary discipline. Everyone, including workers and participants, is in charge of security, so keep an eye on your surroundings and report any untowardly behaviour to the authorities. May Allah enable us to reap the blessings of this auspicious occasion, Ameen.